Do You Need P-80® Temporary Rubber Assembly Lubricants? April 18, 2019 5:01 pm Comments Off on Do You Need P-80® Temporary Rubber Assembly Lubricants? Have You Ever Struggled With Rubber Assembly? How many times have you pushed a rubber hose onto a fitting only to find it wouldn’t slide into place because the fit was just too tight? Or, how about all of those seals and O-rings that twisted or tore because it took so much force to seat them? Remember the frustration you felt after pushing a grommet into place and then watching it pop right back out? If so, you’ve probably experienced for yourself the excessive force needed to properly install hoses, seals, gaskets, O-rings and many other rubber parts. These tasks can be very frustrating and can often require considerable physical effort and time. Rubber materials are inherently difficult to install, remove, or otherwise manipulate – even when wet. The slip-resistant nature of rubber creates a challenge during the assembly and repair of rubber parts. Since these parts play such an integral role in product function and design, it’s important to assemble them properly to avoid future problems with product performance. 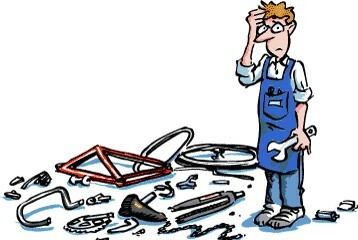 Do Any Of These Assembly Problems Sound Familiar? If so, P-80® Temporary Rubber Assembly Lubricants may be the answer. When applied to rubber parts, P-80 lubricants reduce friction during assembly to make installation easier. Once dry the slipping action goes away and parts stay in place. What Are The Advantages Of P-80 Temporary Assembly Lubricants? A thin film of lubricant applied to a part fills in any gaps, holes, or spaces between two separate surfaces, allowing them to slide across each other. By reducing the tension between the two surfaces, rubber parts can slide into place easily. The force needed to install parts when a lubricant is used is greatly reduced, so engineers can design lower tolerance parts. Since the lubrication is only temporary, once dry, the parts stay in place resulting in a tight fit. Improper part alignment can lead to part failure and safety issues. Using lubricants is one way to ensure that mated parts are properly installed and will work as anticipated. 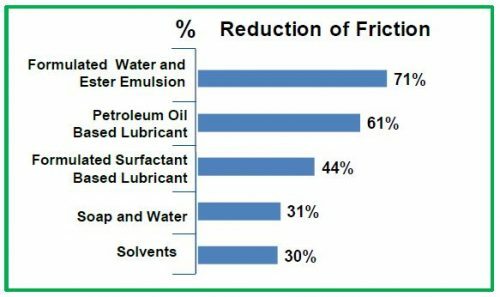 Paring the optimal lubricant with the right application technique speeds up production. An increase in lubricity, even by small amounts, is greatly appreciated by line operators required to maintain strict cycle times. Assembly lubricants ease the installation process of many parts. Workers can more easily push parts into place, reducing the amount of musculoskeletal, slippage, and repetitive stress related injuries that can be caused by using too much force to insert a rubber part. How Does P-80 Compare To Other Lubricants? P-80 lubricants are temporary assembly lubricants, once dry the lubrication ceases and will not reactivate, even when wet. Additionally, P-80 lubricants are environmentally friendly, non-hazardous, and non-flammable, making them safe for workers and most plastics, rubbers, and metals. In fact, most P-80 products are biodegradable. 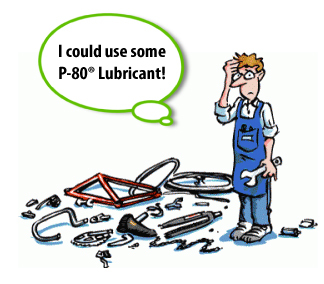 Which P-80 Lubricant Do I Need? Since each assembly application is unique, IPC has developed different P-80 formulas so workers can choose the product that will work best for their particular application. P-80 is available in four ready-to-use industrial formulas, as well as two special formulas that are registered with the NSF as H1 lubricants approved for incidental food contact applications. Many jobs can benefit from the reduced friction and increased safety provided by P-80 Temporary Rubber Assembly Lubricants. Use P-80 the next time you’re having trouble replacing pump seals, installing bushings, assembling O-rings, or pushing hoses onto fittings and you’ll discover for yourself how much easier assembly can be. Any time you encounter rubber parts…P-80 can help! Want to try P-80 lubricants for your challenging rubber assembly applications? Request a free sample today! Cars, trucks, buses, locomotives, motorcycles, boats, airplanes, refrigerators, dishwashers, washers and dryers, pumps, construction equipment, conveyor belts, cable assemblies, and machines…What do all of these familiar items have in common? All of them are composed of countless rubber parts that help them function properly and efficiently. Have you ever considered all of the uses for rubber hoses and seals? Without hoses, seals, grommets, O-rings and so many other rubber parts, most everyday items would leak, fall apart or otherwise malfunction. Since rubber parts play such an integral role in product function and design, manufacturers have to be careful to assemble them properly to avoid problems down the line. While this sounds simple enough in theory, the reality is that assembling rubber parts can be quite difficult. The slip-resistant nature of rubber makes it difficult to install, cut, remove or manipulate. Improper part alignment or installation can lead to part failure and safety issues. Repair and installation of rubber parts can take considerable physical effort and time. Temporary assembly lubricants help solve this problem. When applied to rubber parts, temporary assembly lubricants reduce friction during assembly to make installation easier. Once dry the slipping action goes away and parts stay in place. 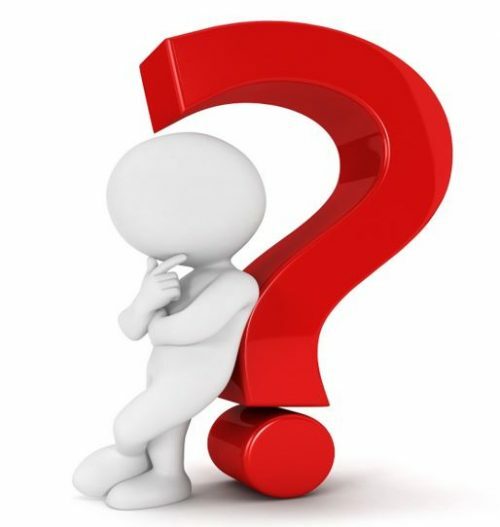 What is the best way to apply temporary lubricants to rubber parts? Brushing, sponging, spraying, dunking and dipping are all effective manual application methods. Since each assembly process is unique, the best method is often based on personal preference. P-80 temporary assembly lubricants are water-based and do not contain alcohol or petroleum distillates, so they will not cause rubber to swell, dry out or harden. And, they do not contain silicon or other persistent ingredients, so once dry the slipping action goes away and parts stay in place. P-80 lubricants are free of hazardous ingredients, making them safe for workers and the environment. Most P-80 products are biodegradable. Want to learn more about P-80 temporary assembly lubricants? Contact IPC’s technical team or request a free sample. How Can You Help Customers Install Your Parts? P-80® To The Rescue! September 20, 2018 3:14 pm Comments Off on How Can You Help Customers Install Your Parts? P-80® To The Rescue! Major manufacturing companies have used P-80 lubricants for years for the assembly of engine mounts, bumpers, seals, belts, bushings, O-rings, hoses, grommets, grips, plugs, moldings, tires and many other rubber or soft plastic engineered parts. Did you know that you can help your customers to easily install those same parts? Simply include a tube of P-80 along with the parts in replacement and repair kits! P-80 temporary assembly lubricants reduce friction during rubber assembly to make it easier to install parts. They are water-based and do not contain alcohol or petroleum distillates, so they will not cause rubber to swell, dry out or harden. P-80 lubricants do not contain silicon or other persistent ingredients, so once dry the slipping action goes away and parts stay in place. And, P-80 lubricants are free of hazardous ingredients, making them safe for workers and the environment. Most P-80 products are biodegradable. P-80 temporary assembly lubricants are available in six different water-based formulas, so you can find the product that’s right for your assembly needs. There are even two special formulas that are registered with the NSF as H1 lubricants approved for incidental food contact applications. P-80 is available in re-sealable 10 mL tubes that are perfect for inclusion in kits for repair or replacement parts. Companies that include P-80 in kits have found that less damage occurs to their products during repair or installation, saving money in the long run. Their customers are happy because the installation of the part is much easier. Since the tube is re-sealable, it can be used multiple times after opening. Many jobs can benefit from the reduced friction and increased safety provided by P-80 temporary rubber assembly lubricants. Use P-80 to install or replace seals, grommets, hoses, valves, belts, bushings, grips, bearings, boots, bumpers, engine mounts, fuel lines, moldings, O-rings, wire harnesses, sleeves, gaskets and tires. Any time you encounter rubber parts…P-80 can help! 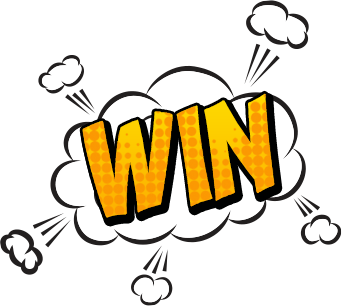 Subscribe to the IPC Blog for more information and helpful tips about using our products! Want to include 10mL tubes of P-80 in your parts replacement and repair kits? Download our product bulletin or contact our product specialists today! 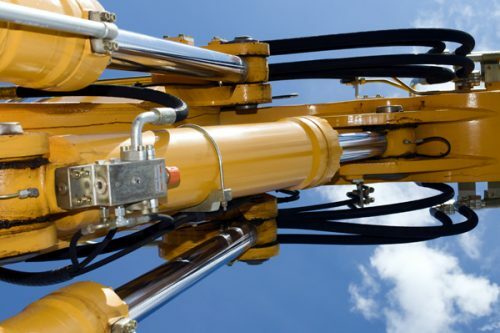 A worldwide crane manufacturer experienced hydraulic system issues, including contamination, rolled O-rings, leaks, and line shut-downs resulting from numerous false-positive leak detections. Once they began using P-80® THIX for assembly they were able to eliminate false positive hydraulic leaks and contamination, allow easier thread starts and aligned joint assemblies, and achieve torque specifications. P-80 THIX is a biodegradable temporary assembly lubricant that eases installation of tight-fitting rubber and plastic parts by reducing the force needed for insertion. Once assembly is complete, the lubricant dries and the part stays in place. Since THIX is a water-based, thixotropic gel, it stays where it’s put without dripping. THIX does not contain any alcohol or petroleum distillates, so it will not cause rubber to swell, dry out or harden, nor does it contain any hazardous ingredients, making it safe for workers and the environment. What Was Happening at the Crane Manufacturer’s Plant? The crane manufacturer was using multiple petroleum-based lubricants for the assembly of hydraulic hoses and thread starts. These lubricants eased the assembly of the hydraulic lines and facilitated thread starts, but, if not applied meticulously, slowed production, increased cost of quality, and increased the amount of rework needed. Over-application of these lubricants caused residue to remain in and around hydraulic lines attracting dirt, contaminating hydraulic systems, fluorescing brightly during black light leak inspections – leading to false positive results, and reducing installation torque over time. When used sparingly, the lubricants caused leaks from rough thread starts, rolled O-rings, friction-related damage, misaligned parts, and low installation torques. They also had frequent line shut-downs because of many false-positive leak detections. A team of design engineers, material engineers and hydraulic line assemblers worked together to find a solution. P-80 THIX was trialed for assembly of hydraulic lines and coating of threads for wet torque starts. Since THIX is a water-based emulsified thixotropic gel, the volume applied was not critical. Once applied, THIX remained in place regardless of the part’s orientation. The gel as a whole reduced assembly friction by 70% thereby eliminating rolled O-rings and misaligned parts. Installation torques were achieved consistently. After assembly, THIX began to evaporate and lose its lubrication – leaving at most a negligible residue, which will not attract dirt or contaminate the hydraulic system, will not fluoresce, and cannot reduce torque over time. The crane manufacturer experienced an immediate improvement in cost of quality and on-time delivery metrics. As a result, THIX has been implemented throughout the entire assembly floor and is currently being trialed at other locations worldwide. Read the full case study and learn more about using P-80 THIX for assembly and maintenance of construction equipment. Want to try P-80 for your assembly or repair needs? Request a free sample. Contact IPC’s technical team to help you find the best solution for your assembly needs. Assembly and repair of helicopters can be difficult. Helicopters are composed of numerous rubber parts, many of which can be hard to install or replace. Rotor blades, shafts, landing skids, control rods, stabilizer bars, pitch levers, blade grips, isolators, bushings, hoses, rotor seals, and tail booms are some of the many helicopter parts that are either composed of rubber or connected with rubber parts. Unlike traditional airplanes, helicopters have a unique ability to land and take off vertically and to hover in place. A helicopter’s ability to lift and thrust comes from its rotors. These unique properties must be designed to exacting standards, with no room for compromise. High quality materials should be used to ensure that parts are properly installed and assemblies are completed perfectly every time. Reliance on anything other than specialty lubricants, formulated specifically for rubber assembly, creates risks for failure from the onset. Rubber is naturally slip resistant, making it difficult to work with. Installing, removing or manipulating tight fitting rubber components can be a real challenge. Parts that are improperly aligned or installed may result in performance or safety issues. Temporary assembly lubricants make rubber installation easy. This diagram shows some of the many helicopter parts that can benefit from using a temporary assembly lubricant for installation. P-80® Temporary Rubber Assembly Lubricants significantly reduce friction helping rubber parts slide easily into place. And, P-80 lubricants do not contain any hazardous ingredients, making them safe for workers and the environment. P-80’s unique, water-based formula is temporary; once dry, P-80 stops lubricating and parts remain in place. Try using a rubber assembly aid the next time you’re installing rotor blades, seals or dampers and see how much easier the job becomes. Want to try P-80 for your assembly or repair needs? Request a free sample. Read more about temporary rubber assembly lubricants, including how to use them and factors to consider when choosing a lubricant. Or, contact our technical team to help you find the best solution for your assembly needs. Stop Struggling … See How Temporary Lubricants Make Rubber Assembly Easier! December 1, 2017 4:43 pm Comments Off on Stop Struggling … See How Temporary Lubricants Make Rubber Assembly Easier! Have you ever struggled with rubber assembly? If so, you’ve probably experienced for yourself the excessive force needed to properly install hoses, seals, gaskets, O-rings and many other rubber parts. Wouldn’t it be nice if someone came up with a better way? 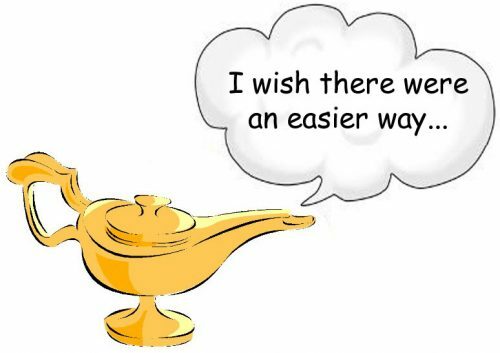 Your wishes have been granted! Temporary rubber assembly lubricants were developed specifically to solve this common problem. Temporary rubber lubricants can ease assembly processes and significantly reduce the force needed to assemble rubber parts. So, how effective are temporary assembly lubricants? Why not see for yourself? 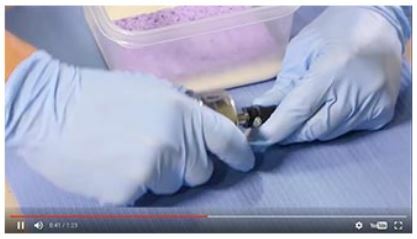 International Products Corporation (IPC), manufacturer of P-80® temporary rubber assembly lubricants, put together this short video showing the reduction in force obtained by using P-80® Emulsion to assemble a rubber hose. The results of this test are dramatic. A 63% reduction of force was achieved by using P-80 Emulsion for this assembly. 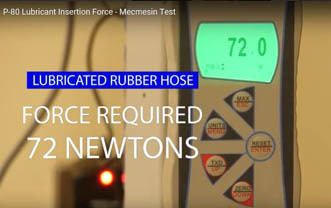 A digital force gauge manufactured by Mecmesin was used for measurement. The amount of force needed to assemble a dry piece of hose was 196 Newtons. IPC’s test lab then lubricated the same hose with P-80 Emulsion and the amount of force needed for the same assembly dropped to 72 Newtons. That represents a reduction of force of 124 Newtons or 63%. What are some of the advantages of reducing the force required to install rubber parts? The next time you’re having trouble with hoses, seals, gaskets, O-Rings or any other rubber part, remember to use a temporary rubber assembly lubricant and watch the parts slide into place with much less force. Temporary lubricants are ideal for rubber assembly because they reduce the friction needed to assemble parts. Want more information about temporary rubber assembly lubricants, including how to use them and factors to consider when choosing a lubricant? Contact IPC for help finding the best solution for your assembly needs. Pumps and seals perform vital functions in food and beverage processing plants. Using the right assembly lubricant for pump maintenance makes all the difference. Manufacturing facilities strive to keep operations running smoothly and effectively at all times. This is true for all types of plants, whether they manufacture industrial products or foods and beverages. While many factors contribute to achieving this goal, one simple way to help reach this objective is to perform regular equipment maintenance. Most plants use a variety of different types of pumps. Maintaining and replacing pump seals on a regular basis helps to ensure that systems continue to function efficiently. 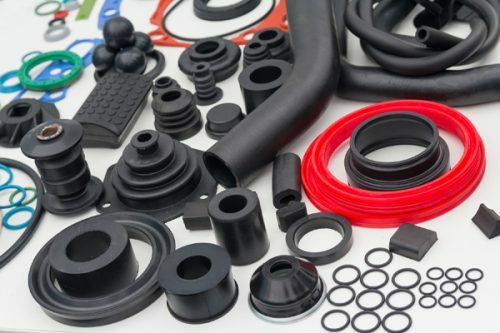 Replacing standard pump components, such as seals, O-rings, and other rubber parts, can often lead to frustration because the slip resistant nature of rubber makes it difficult to install, cut, remove or manipulate. Parts may roll or tear. Repair and installation can take considerable physical effort and time. In addition, improper part alignment or installation can lead to part failure and safety issues. Pumps play an extremely important role in food and beverage manufacturing. They are used for fermentation, separation, evaporation, homogenization, filtration, processing and dosing. Mechanical seals are frequently used to help ensure that no contaminants enter the processing system. Mechanical seals help to minimize leaks, avoid flow irregularities and maintain product integrity. They can help prevent the transfer of ingredients from one product to the next, and prevent formation of deposits inside the pump that can develop into mold or bacteria, causing contamination. Food processing plants have added concerns that must be considered. Food and beverage manufacturing is a highly regulated industry. Therefore, all parts and processes must comply with federal regulations and industry standards. Mechanical seals need to be made of food grade materials, and all lubricants used for seal maintenance must also be approved for incidental food contact applications. Just like in industrial settings, pumps used in the food industry should be well maintained to avoid costly repairs and minimize downtime. Maintenance procedures must meet strict FDA and USDA requirements. Using the proper assembly lubricant can turn a difficult chore into an easy task. Many jobs can benefit from the reduced friction and increased safety provided by an assembly lubricant. 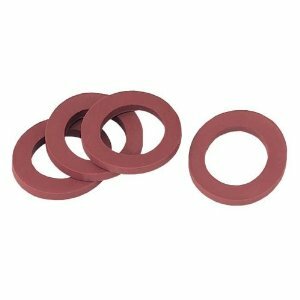 They are the perfect solution for pump and seal repairs and have been used for years by plant managers to maintain equipment and replace parts such as mechanical seals, O-rings, hoses, grommets, and plugs. Reduce Installation Force: A thin film of lubricant allows rubber surfaces to slide across each other. By reducing the surface tension between two surfaces, lubricants help rubber parts slide easily into place. Once dry the lubrication is gone, resulting in a tight fitting assembly. Achieve Closer Fits: Engineers can design lower tolerance parts. The force needed to install the parts when a lubricant is used is greatly reduced. Since the lubrication is only temporary, once dry, the parts stay in place resulting in a tight fit. Improve Product Performance: Improper part alignment can lead to part failure and safety issues. Using a rubber assembly lubricant, which enables the parts to slide easily into place, can solve these problems by reducing or eliminating damage to parts. Increase Production Rates: Applying an assembly lubricant to the rubber part makes the rubber slippery, so parts can easily slide into place. After the lubricant dries, the lubricity goes away and mated parts maintain a tight fit. The assembly process becomes more productive. Help to Avoid Worker Injuries: Lubricants reduce the insertion force needed for rubber assembly. Workers can more easily push parts into place, reducing the amount of musculoskeletal, slippage, and repetitive stress related injuries that can be caused by using too much force to insert a rubber part. There are many types of lubricants available, so how does a plant manager choose the right one for the job? It’s important to consider the performance and safety of each to make the right choice. Solvents offer poor lubrication (as compared to other choices). More importantly, these substances may be flammable and pose various safety risks. They may also dry out the rubber parts. Soaps and Detergents offer nominal lubricity but can reactivate later on when wet, causing parts to move when they need to remain stationary. Petroleum Distillates are often not compatible with rubber parts causing them to swell. The lubrication is not temporary. 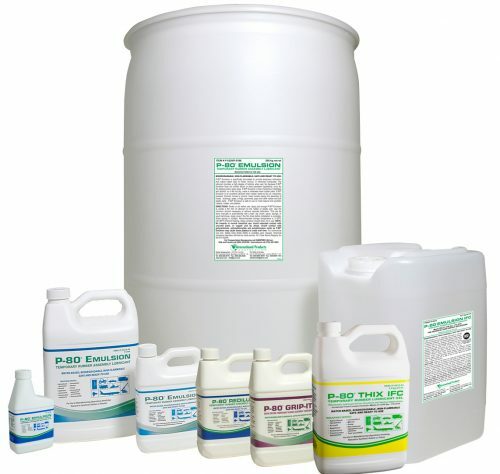 Specially Formulated Ester Based Products offer temporary lubrication providing excellent reduction in friction. These lubricants are safe for the environment, the parts and the workers. Plant managers need to choose a lubricant that will work well, yet meet all safety requirements and federal regulations. They must also consider variables unique to their specific needs such as surface compatibility, dry time, conductivity and chemical composition of the lubricant. Specially formulated, temporary rubber assembly lubricants are a preferred choice. They have a consistent composition, favorable compatibility with most surfaces and are not harmful to the environment. In fact, many of these lubricants are biodegradable. Food and beverage processing facilities must also be sure to use specially formulated temporary assembly lubricants that meet federal regulations and are approved for incidental food contact applications. Many food and beverage processing plants rely on P-80® Temporary Rubber Assembly Lubricants to help with pump maintenance. P-80 lubricants enable rubber parts to slide easily into place with minimal force. Once dry, P-80 stops lubricating and parts remain in place, resulting in a tight fit. Since P-80 does not contain silicon or any other persistent ingredients, once dry the slipping action goes away. P-80® Emulsion IFC and P-80® THIX IFC meet FDA regulation 21 CFR 178.3570 and are NSF-Registered as H1 lubricants. Both are biodegradable and non-toxic, ideal for use in incidental food contact applications when a thin film of lubricant is desired. The next time you’re having trouble replacing a pump seal, inserting a grommet, or pushing a hose into place, try using a temporary rubber assembly lubricant. See how much easier the job becomes. Frustrated by Heavy Duty Truck Assembly and Repair? July 28, 2017 2:12 pm Comments Off on Frustrated by Heavy Duty Truck Assembly and Repair? 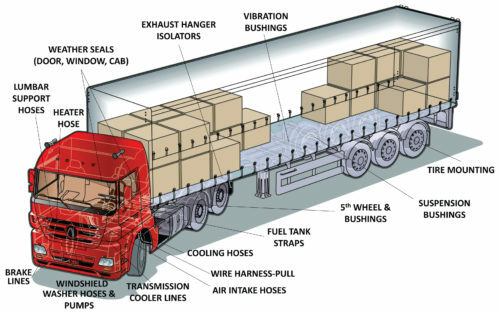 What is one of the most frustrating tasks of heavy duty truck assembly and repair? Installing or replacing rubber parts! Heavy duty trucks and trailers are full of rubber parts. O-rings, bushings, leaf springs, seals, hoses, engine mounts, belts and gaskets are just some of the parts that can be difficult to install or replace. Many of the chassis, engine and suspension components are made of rubber or plastic. Rubber is naturally slip resistant, making it difficult to work with. Trying to install, remove or manipulate tight fitting rubber components can be a real challenge. Parts that are improperly aligned or installed may result in performance or safety issues. Using a temporary assembly lubricant, like P-80®, makes rubber installation easier and helps avoid these types of problems. P-80 temporary rubber assembly lubricants are designed to decrease the installation force needed to install rubber parts, enabling them to slide easily into place with minimal force. And, P-80 lubricants do not contain any hazardous ingredients, making them safe for workers and the environment. P-80’s unique, water-based formula is temporary; once dry, P-80 stops lubricating and parts remain in place. The next time you’re having trouble pushing a hose into place, inserting a leaf spring or installing suspension bushings try using P-80 and see how much easier the job becomes. 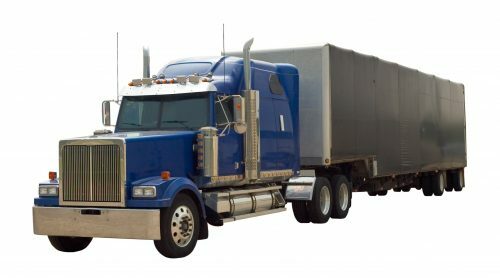 Temporary lubricants are ideal for truck applications because they reduce the friction needed for assembly and repair without damaging the parts. Want to try P-80 for your heavy duty truck assembly or repair needs? Request a free sample. 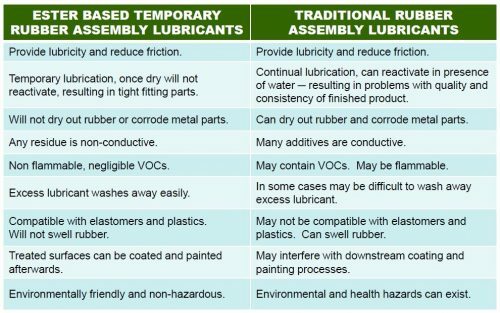 Want more information about temporary rubber assembly lubricants, including how to use them and factors to consider when choosing a lubricant? Download IPC’s free P-80® webinar. 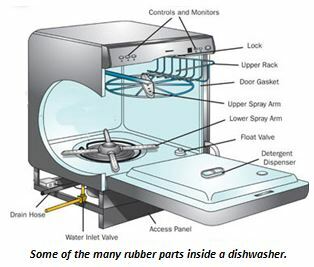 Dishwashers, washers and dryers, refrigerators, mixers, blenders, and many other appliances are composed of numerous rubber and soft plastic parts. Hoses, O-rings, seals, grommets, plugs, belts and valves are just some of the many parts that can be found in common household appliances. Rubber’s slip resistant nature can make appliance assembly difficult. Using a temporary rubber lubricant during assembly can make appliance manufacturing much easier. Maintenance and repair of common appliances is also less difficult when temporary assembly lubricants are used to replace belts, O-rings, hoses and seals. P-80® temporary rubber assembly lubricants significantly reduce friction helping rubber parts slide easily into place. P-80® lubricants are water-based, and do not contain alcohol or petroleum distillates so they will not cause rubber to dry out or harden. P-80® does not contain silicon or other persistent ingredients, so once dry you have a tight fitting part. Interested in learning more? Download a case study detailing how one major appliance manufacturer benefited from using P-80® to reduce drop test failures. Stop struggling with rubber parts during appliance repair and assembly. 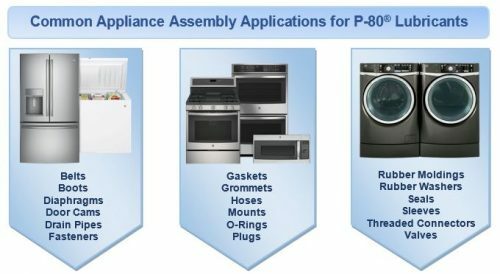 Contact IPC to discover how you can benefit from using P-80® temporary lubricants for appliance assembly and repair.